Shadowing a DO and Learning About the Practice of Osteopathic Medicine – Many colleges require applicants to get to know a DO and request a letter of recommendation as part of the application process. Applicants should meet and spend time shadowing the physician. This provides the applicant with exposure to the osteopathic profession and enhances awareness of osteopathic medical philosophy. Working with a physician will prepare the applicant for the application interview. Completing this crucial step also demonstrates the applicant’s commitment to the osteopathic profession. “Yet it should be noted: Getting into osteopathic school is still excruciatingly tough. Last fall, almost 16,500 students applied for some 6,400 spots. Touro this year received 6,000 applications for 270 first-year seats for the Manhattan school and a new campus opening this summer in Middletown, N.Y. (The average M.C.A.T. score for students entering this fall was just a point below the M.D. average. )” Read more. This entry was posted in Midd Blogosphere and tagged Career Exploration, Graduate/Professional School, health care, Health Professions, Osteopathic Medicine on March 19, 2019 by Nicole Veilleux. Interact with Osteopathic Medical Students! This entry was posted in Midd Blogosphere and tagged Allopathic Medicine, Graduate/Professional School, health care, Health Professions on February 25, 2019 by Nicole Veilleux. Gaining clinical experience is an important part of the medical school application. But to be a competitive medical school applicant, some have questioned if it’s necessary to shadow a doctor. It’s true that shadowing is great experience, as it exposes you to patient care in a clinical setting and gives you an idea of the day-to-day demands of a medical career. But as a pre-med student, you’re often balancing a rigorous academic schedule, along with extracurricular and personal responsibilities, so shadowing may not be a possibility. 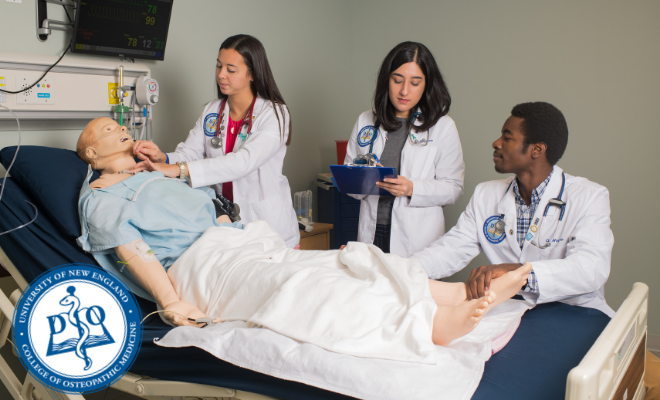 Click here for the full AAMC article on gaining experience without shadowing. This entry was posted in Midd Blogosphere and tagged Allopathic Medicine, Graduate/Professional School, Health Professions on February 22, 2019 by Nicole Veilleux.